OCCURRED: March 3, 2019/ Between 6:09 p.m. and 9:23 p.m.
On March 3, 2019, at approximately 6:12 p.m., the University of Maryland Police Department responded to Elkton Hall for a suspicious person. A female entered two unlocked rooms at Elkton Hall. Both rooms were occupied at the time of the incident. The female engaged in conversation with the residents of each room. The female then left in an unknown direction of travel. Later in the evening UMPD responded to South Campus Commons #6. A female entered an unlocked room, stole property and left. Officers located the female and it was determined she was the same individual from Elkton Hall. The female was taken into police custody for processing. The female has no UMD affiliation. 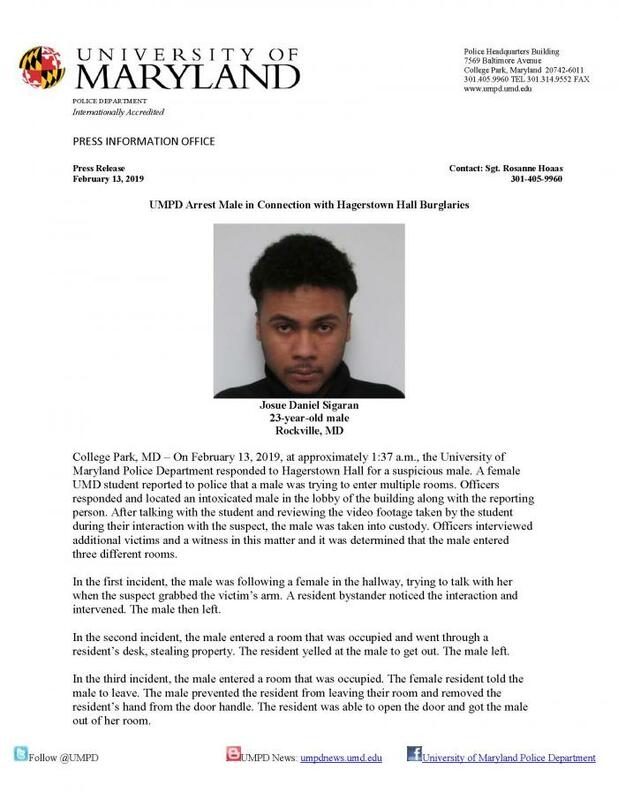 OCCURRED: February 13, 2019/ Approximately 1:30 a.m.
On February 13, 2019, at approximately 1:37 a.m., the University of Maryland Police Department responded to Hagerstown Hall for a suspicious male. 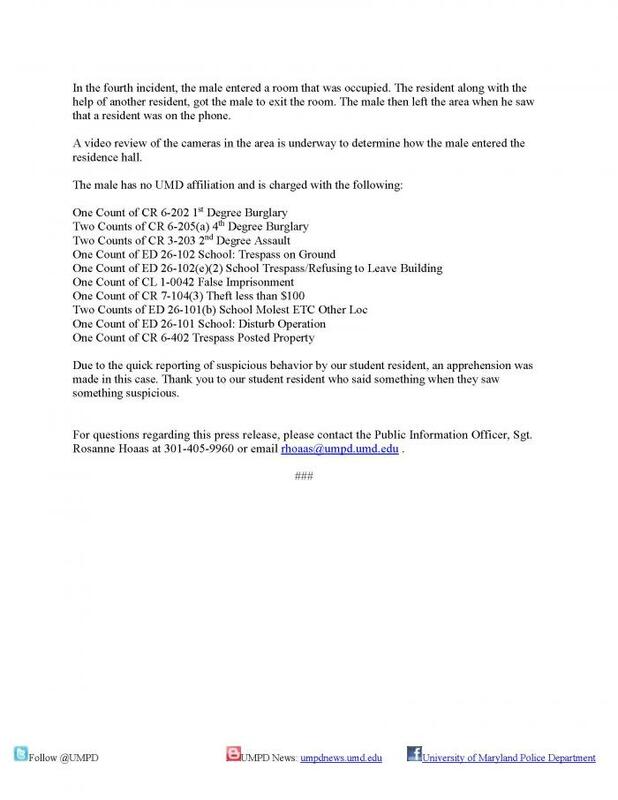 A female UMD student reported to police that a male was trying to enter multiple rooms. Officers responded and located an intoxicated male in the lobby of the building along with the reporting person. After talking with the student and reviewing the video footage taken by the student during their interaction with the suspect, the male was taken into custody. Officers interviewed additional victims and a witness in this matter. Based upon the investigation, the male has been charged with multiple counts that can be viewed here. 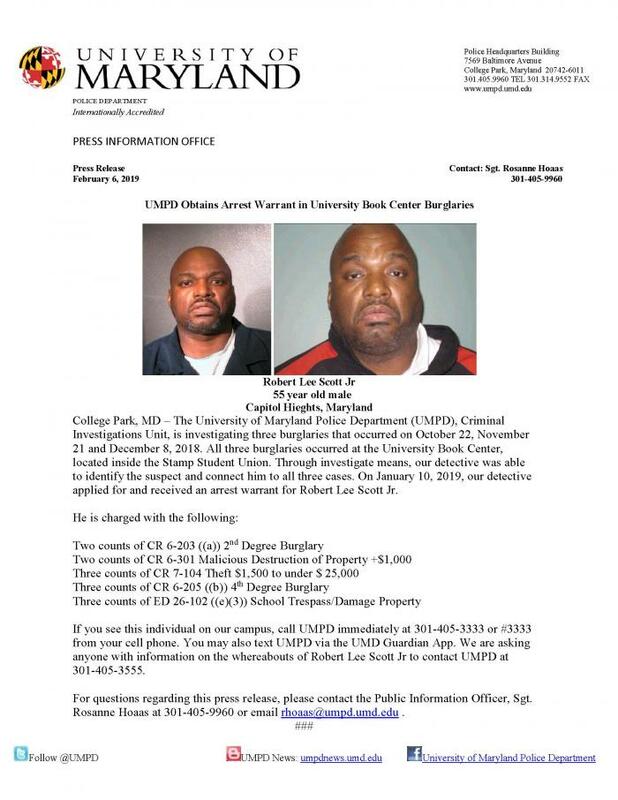 Due to the quick reporting of suspicious behavior by our student resident, an apprehension was made in this case. Thank you to our student resident who said something when they saw something suspicious.